Our trees have been lovingly nurtured to give only the finest natural ingredients. Citrina fruit is highly versatile, letting you experiment with anything from cocktails to desserts to main dishes – and wowing guests with your home-grown produce. With so many exciting possibilities, you will be keen to start playing in your bar or kitchen straight away…so to help you get started here are some tried and tested recipes for Kumquat - a fruit of our Ophelia. Melt the chocolate with the butter in a "bain marie" or in a microwave oven. Meanwhile, beat the egg whites and add the sugar. Continue to beat for a few minutes to dissolve the sugar. Mix the chocolate and butter. Add some egg whites into the chocolate and whisk. Pour the chocolate mixture over the remaining egg whites. Stop mixing as soon as the whites and chocolate are well incorporated. Transfer the chocolate mousse into a bowl and let it rest in the fridge (minimum 1h). Cut the kumquats in half and empty them. 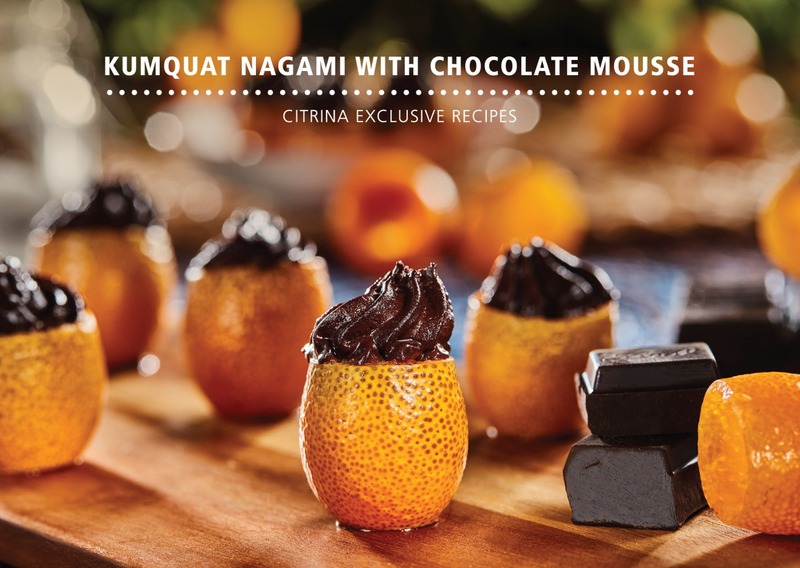 Put the chocolate mousse in a piping bag and then garnish the Kumquats.